A coastal town with a population of around 9,000 people that is situated at the mouth of the River Colne and Brightlingsea creek. Formerly a Cinque Port, associated with Sandwich, its traditional industries included fishing and shipbuilding . 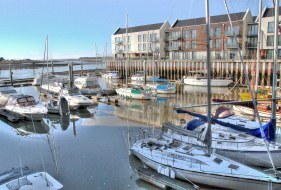 In recent years the foreshore area by the quay has been developed with a marina and modern housing. The town is very popular with boating enthusiasts and along the western promenade there is a parade of traditional beach huts. Within the town centre is Jacobs Hall which is a period building dating from the 14th century that reputedly is the oldest timber framed building in the country.